The other night I was with my boys under the stars. My five year-old looked up and said, “Daddy, I see Orion.” Of course this was impossible in the early September evening here in Utah. Orion is a winter constellation and won’t be up before bedtime for a few more months. But the three stars he was pointing to DID look a little like the belt of Orion. The differences were that they weren’t perfectly aligned like the stars in Orion’s belt, and the middle star was quite a bit brighter. 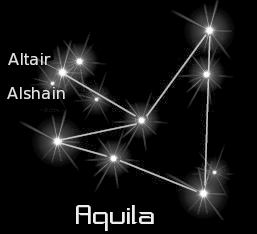 Of course, what he had really found was Aquila the Eagle flying in the night sky. In mythology, Aquila was a go-fer for Zeus. His main job was delivering thunderbolts to Zeus when he needed to zap someone. 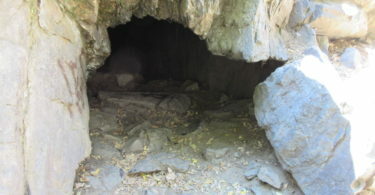 He also fetched the shepherd boy Ganymede to Zeus on Mount Olympus. Interestingly, Ganymede is the name of one of the moons of the planet Jupiter. 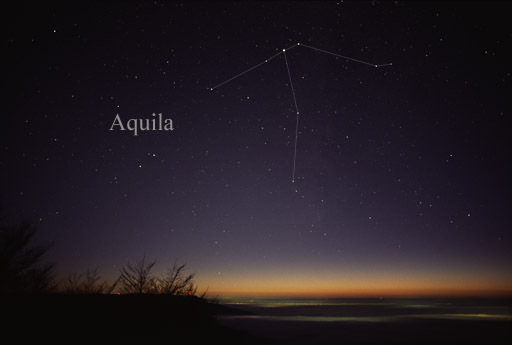 Aquila is easy to find because it does look a lot like Orion. Find the 3 stars in a not-quite-perfect line with not-quite perfect spacing. The center star is very bright and is named Altair. 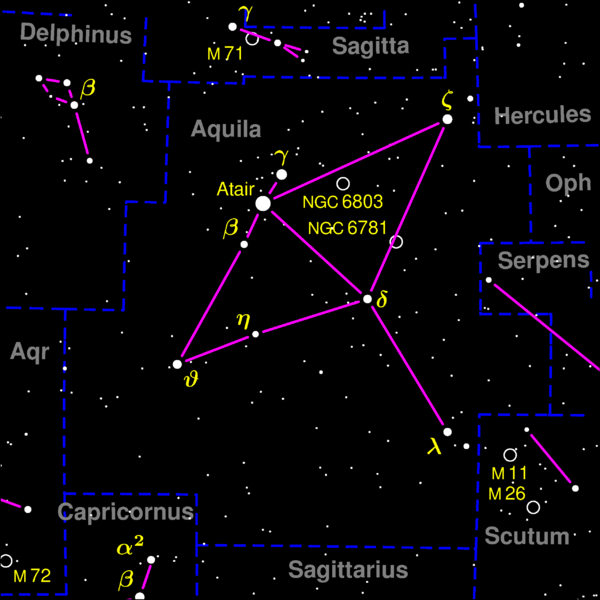 Aquila is located between Sagittarius and Cygnus. In fact if you can find Cygnus flying through the Milky Way, look just off his right wing and ahead of him. Delphinus is also nearby. Part of Aquila extends into the Milky Way.